The parents complained and called the media, now the school have expelled Riley and his four year old brother. It seems to me that another approach could have been taken: the school could have gathered together parents and children to discuss healthy eating. They could have set up cooking classes so that pupils could make their own lunch box foods. What was it that Blair used to say? Education, education, education. Teach kids and parents about food. I don’t think mini-cheddars, which are baked, are particularly unhealthy, not as bad, for instance, as the Smartie sandwich which the Daily Mail also reported on a while back. 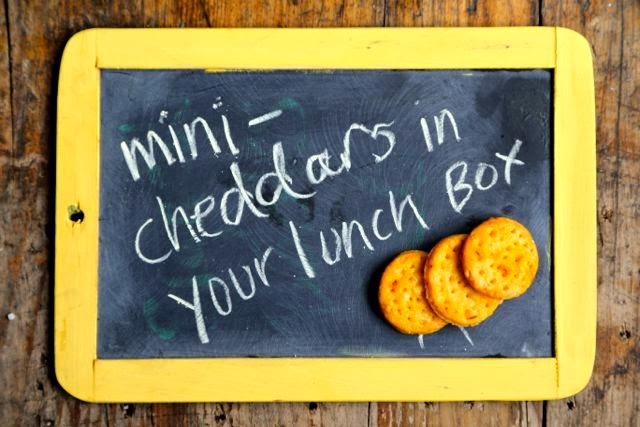 So what do mini-cheddars consist of? According to their literature they are composed of the following ingredients: Wheat Flour,Vegetable Oil, Dried Powdered Cheese (12%), Sugar, Glucose Syrup, Salt, Dried Whey, Barley Malt Extract, Raising Agents (Ammonium Bicarbonate, Sodium Bicarbonate), Lactic Acid, Natural Flavourings. They contain no additives and are free from artificial colours or flavours. 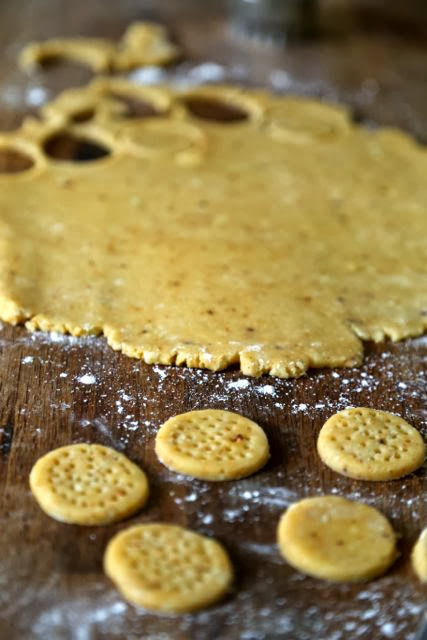 I do like mini cheddars so I thought I’d have a go at making some myself. This took so little time, maximum half an hour including both prep and baking time that I think parents could easily whip up a few batches for their children’s lunch boxes. Maybe Riley’s mum would like to have a go? What do you give your kids for lunch? 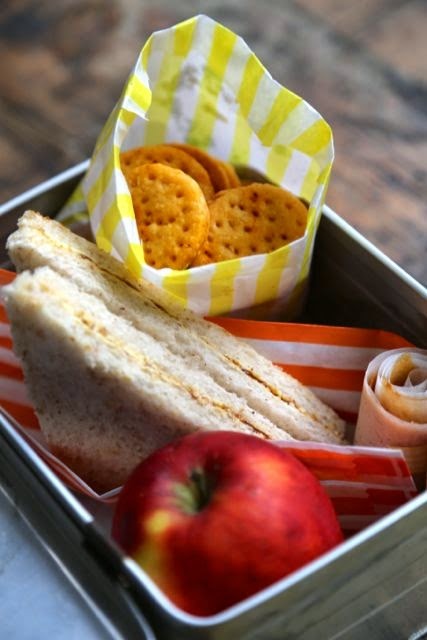 I would often make lovely tiny bento boxes for my daughter, which teachers would envy, but she would look longingly at the junk food of her friends. Tired working parents are no doubt doing their best but perhaps they simply don’t have the energy to make good lunches for their children? You can add herbs such as chives or a teaspoon of chipotle paste, or a tablespoon of Marmite, to spice them up if you wish. 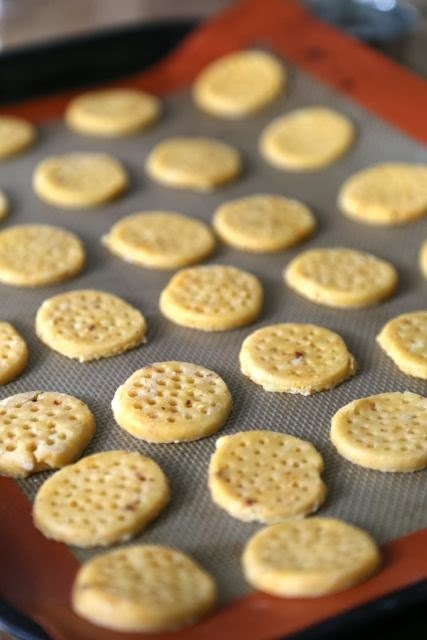 Leave to cool on the tray then remove the biscuits. Store in a dry place. Does this lunchbox pass muster? Contents: one apple, one Marmite sandwich, 2 fruit leather rolls made from yellow plums, 1 pack of mini-cheddars (home-made). My word- what a story behind this bake. To expel a couple of young kids because of their contents of the lunchbox?? I reckon your lunchbox would definitely pass muster! It seems an extreme reaction doesn't it? I'd be very happy to a) send this lunch into school to feed my child b) eat it myself. It's cold McDonalds and KFC in lunchboxes which should be policed….but expelling…..it would have sent me on a mini Cheddar feasting spree. I love your recipe but I'm undecided about the issue. I don't agree with punishing children for the issues of the parents but it wasn't actually the mini cheddars. If you actually read what was in his lunchbox typically it was; sandwich (unspecified filling), dairylea dunkers, fromage frais and mini cheddars. Irrespective on the sandwich filling and unlike your lunchbox, that is not balanced. The school is in special measures and are trying to improve their rating through things like a healthier eating programme which we all know does help behaviour. You have to wonder at the parents who decide not to support this and, when asked to improve, decide to go to the media instead. I can't imagine this was the school's first step after all. And, having gone to the press with what the school claim is a misrepresentation of the facts, they chose to expell the kids. Is any of this good for the kids? Well a healthier diet would be but expelling children isn't. But where is the parental responsibility here? I agree that mini cheddars in isolation I would say weren't too bad but alongside a diet lacking in fruit and vegetables (unlike your box), it's not great, especially as the main nutrients are fat, salt and refined carbohydrate. To sustain kids through the afternoon, having them alongside some slower release energy would be much better. Of course though not all kids will eat the whole lunchbox contents so I can see in a way why schools make rules like this. It does make sense to have something simple and easy to understand and fundamentally I don't think there's anything wrong with lunchbox rules. I'd rather have that than lunchboxes being banned. I'm really looking forward to making packed lunches for my son. It's a chance to not only provide physical support for the day but emotional support too. It will be my little bit of love in a box for him to take with him on his day and love in my view, however, snobbish it sounds, is not a pack of Dairylea Dunkers. 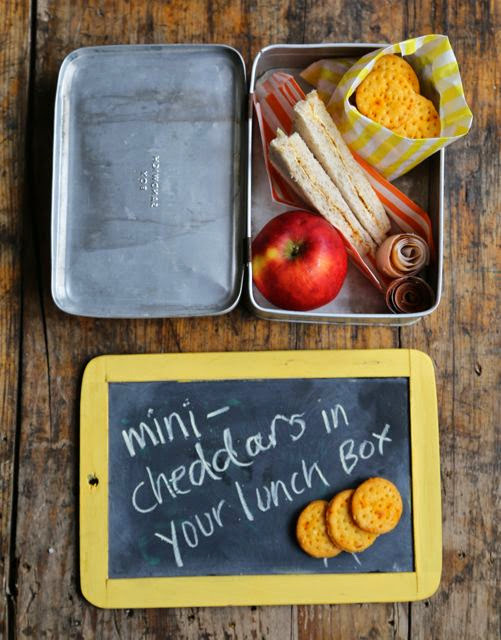 Dairylea dunkers, fromage frais, mini cheddars aren't the WORST lunchbox items though are they? It's not like it's chocolate mini rolls, smartie sandwiches etc. But thanks for the extra info regarding the school. How old is your son? I found that like all parents, you have this idea that you are going to be the perfect parent, and then reality sets in: the routine is boring, there are days when you don't get it together, the kids resist healthy eating, their mates don't have to do it, so it becomes a chore rather than a pleasure. My daughter was very easy on every level to bring up, except for food. I loathed feeding her because she was so resistant to new foods and vegetables. I know that kids have delicate stomachs and prefer bland foods but with her, it was ridiculous, she'd literally only eat about 4 things. As a single parent especially, I just got tired. Fromage frais was a little treat for her. In France all kids eat fromage frais or a yoghurt once or twice a day. But a piece of fruit does balance out all the carbs and dairy. I found my daughter was more likely to eat the fruit if I cut it up into slices. Things being 'bite sized' were effective in getting her to eat. They are really easy! In fact if you are using a food processor, you don't even have to grate the cheese. Another step of the recipe removed! I think that your comments above are extremely relevant. I too tried giving my kids healthy options, never gave them fizzy drinks or added sugar to cereal, tea etc and they also longingly looked at junk food. WIth all the news now that sugar is the "new nicotine", more people will be addressing the food we give our young children. My kids are now students and only time will tell if they find alternatives to KFC, Nando's etc. Yes my daughter, who was home this weekend, is now at uni. Her diet is much more varied nowadays which is a relief. In fact, starting the supper club and having her help me out, made her much more open to different foods. She wants a small food processor for her birthday to help her prepare more intricate recipes, which is a great sign too! I keep asking her to do a guest post on student food. The stories she tells me are gob smacking. My son was told off on friday for eating his banana before his sandwich? Obviously he is somehow going to a school in the 1950's. Nooo! That's like food dictatorship. Bananas are one of the best foods: they make you happy too. Oh, I used to love Mini Cheddars. I'd sit one on my tongue then press it into the roof of my mouth till it started to dissolve. Or I'd do that for the first couple and then chomp my way through the rest of the bag. Quite fancy a Smartie sandwich now. Though that could be because I'm very impressionable and easily lead. Yeah I like that quality in them too. I like putting loads in my mouth and then they all clag together on my palette. It's such a nice feeling. Smartie sandwiches, yay! They look fantastic! When my kids were at primary school they had proper sit-down lunches, the moment they went to secondary school it all went to pot and I hated it. 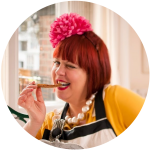 I would have loved it if my kids were given a modern, fun and appealing lunch like above and would have paid extra instead of Pasta King (a sloppy packet mix thing – yuck) which they seem to opt for due to lack of choice available. And another thing, if my kids had the choice of something like above on the menu at school – they would have bought it and instragrammed it! I don't see #deliciousschooldinners on IG when I look. Bytheway, I'm so doing this recipe. Banana before sandwich? Sandwich before banana? Put the two together and make a banana sandwich! That often gets this teacher in Bermuda through the day. But in Spain, nearly 40 years ago, it was a 'merienda', a hunk of crusty bread with a small bar of chocolate inside. I wonder if that tradition has died out? They still do le gouter in France, chocolate in a buttered baguette. I think banana sandwich is very healthy. The entire time I traveled through India I lived on chapatis with bananas. Binds you up nicely too! i think this is such a ridiculous act by the school. since when were lunch boxes ofsteded? haha Minister for packed lunch! Have you thought about adding smoked paprika to these? I think that'd be awesome! nice idea! I love smoked sweet paprika! Just made my first batch. Had to use 150g mature chedday and 40g parmesan as Mr GG raided the cheese box despite my instructions. used smoked paprika. Smelt gorgeous whilst cooking, had a sneaky taste whilst lukewarm. Bloody wonderful, am expecting Mr GG snaffle the lot when he gets home from work. Providing the biscuit is of the same thickness, pretty much the same time. I'd check after 15 minutes and give maybe 5 minutes more? Cannot wait to try these for my kids cookery class this week, they look awesome! Can you freeze these at all? Made these before and they were amazing, but would be great to make them ahead! You could certainly freeze the dough. Just made these. I had to add a splash of water to bring the dough together. The recipe says it makes 15, but I got 78 and it would have been more if I'd re-rolled a third time. When I make them again I'll roll the dough thinner because they have puffed up a little, so I reckon I'd get well over 100. Glad I didn't double the recipe as I was tempted to. I knew I wanted more than 15, but my instinct told me the quantities involved would make more. wow 100? Actually I think it's great if they puff up a bit. It seems to be done easily. Thanks! Wow so extreme to expel kids because of the content of their lunchboxes. My son is now in middle school and i still pack his lunch box. It contains 2 portions of steamed rice, 2 portions of korean stirfried pork or beef or chicken curry, 2 portion of sautèed veg & 1 banana. He’s a growing boy who needs all the calories. He prefers to eat his snacks at home though.